WELCOME to the Out Now LGBT inclusion hub. Working in the travel industy? Join the ONBC global Out Now Business Class network free. At Out Now we say that 'LGBT' spells people. a. Fill in your details in the form at the bottom of this page. b. Confirm your subscription by clicking on the confirmation link in the email you then receive. c. Then click on "continue to our website", to access the reports you want. 1. Business Case data - we are pleased to welcome you to our website and would like to invite you to obtain your free copy of the 'LGBT Diversity: Show Me The Business Case' report. To request your free Business Case metrics report, please use the form at the bottom of this page. We are delighted to release the first in the new global round of LGBT2030 research by Out Now from the great country of Brazil. To download, simply fill in the form at the bottom of this page and when you click the confirmation link in that email you will reach a link to both English and Portuguese language versions of this report. Report sponsors include: Switzerland Tourism and Hornet. 3. 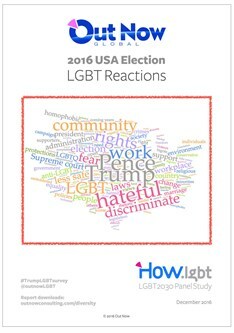 2016 USA Elections: LGBT Reactions - discover what LGBT people and their allies think about the victory of Donald Trump and Mike Pence. Fill in your details below to download this report. 4. LGBT Allies: The Power of Friends - to request our latest LGBT Allies metrics report, read the instructions at the top of this page and then fill in the form immediately below. 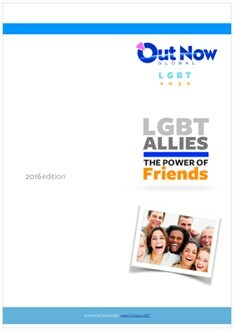 Fill in the form below to access your complimentary copy of the Out Now Diversity Leadership report - LGBT Allies: The Power of Friends. We believe that the LGBT2030 data contained in the report below has the potential to make people's lives better - right across the world. ACCESS ANY OF THESE GREAT REPORTS. TO DOWNLOAD: fill-in the form below. Out Now is pleased to present the world's first report measuring the value of the business case behind LGBT workplace diversity. Out Now is a specialist LGBT (lesbian, gay, bisexual, trans) diversity consultancy with nearly 25 years of experience of helping companies to better understand the continuing integration of LGBT people in societies all over the world. Out Now has worked for clients in more than a dozen countries globally, and is also one of the most experienced LGBT development organizations in the world. Out Now specializes in issues regarding LGBT diversity in the workplace, consumer research and business development opportunities for leading-edge companies looking to develop and leverage their own diversity initiatives. Our understanding of the issues that can companies can face comes from our world-leading research initiative - LGBT2030 - which affords us the unparallelled insights to develop strategic initatives for our clients. Out Now has delivered ground-breaking diversity projects, research studies and communications initiatives aimed at LGBT people for leading organisations such as Nationwide Building Society, AXA, IBM, Lloyds Banking Group, the NHS, Barclays and Barclaycard. This ground-breaking research initiative has sampled LGBT people in twelve languages and living in 24 countries across five continents, and is providing the clearest ever picture into the lives of LGBT people globally that has ever existed. Our most recent research report to be released from the LGBT2030 study is the 'LGBT Diversity: Show Me The Business Case' report, which quantifies the business case for companies to better implement workplace initiatives for LGBT workers globally for the very first time. At Out Now we always strive to take an innovative approach to our research projects, which helps us to build a better understanding of LGBT communities, because at Out Now we firmly believe that LGBT spells people. 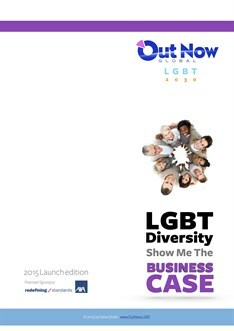 Request your free copy of the 'LGBT Diversity: Show Me The Business Case' report here. Simply fill in the request form, then accept the email subscription confirmation you receive - and when you do that, you will receive a link to your copy of the report. Questions? Comments? Get in touch with us.